(a) Install the 2 oil cooler brackets to the oil cooler assembly with the 2 bolts. 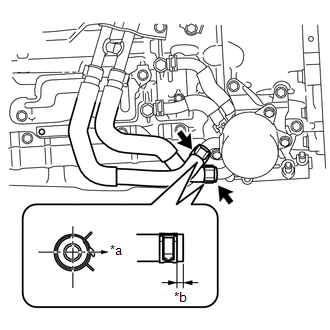 (b) Install the oil cooler assembly to the vehicle body with the 3 bolts in the order shown in the illustration. (a) Install the No.1 oil cooler tube sub-assembly to the oil cooler bracket with the bolt. When connecting the hoses to the tube, support the tube by hand and be careful to prevent the tube from being deformed. Make sure to install the clips so that the spool fitting is not overlapped. (a) Install the No. 6 oil cooler inlet hose and No. 6 oil cooler outlet hose to the oil cooler assembly, and slide the 2 clips to secure them. Make sure to install any hose clips without a specific installation direction in a direction that does not interfere with other parts. (b) Connect the No. 6 oil cooler inlet hose and No. 6 oil cooler outlet hose to the No.1 oil cooler tube sub-assembly, and slide the 2 clips to secure them. 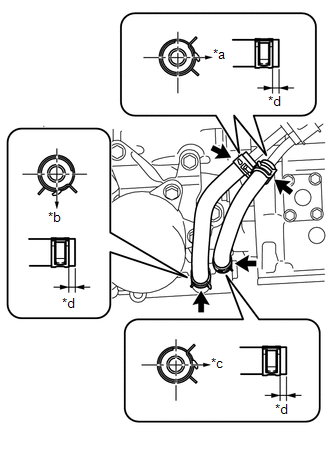 (a) Install the oil cooler tube to the vehicle body with the 2 bolts. (a) Install the No. 5 oil cooler outlet hose to the No.1 oil cooler tube sub-assembly, and slide the clip to secure it. (b) Connect the No. 5 oil cooler outlet hose to the radiator assembly, and slide the clip to secure it. (1) Install the No. 4 oil cooler inlet hose and No. 4 oil cooler outlet hose to the radiator assembly, and slide the 2 clips to secure them. (1) Install the No. 4 oil cooler inlet hose and No. 4 oil cooler outlet hose to the radiator assembly and No.1 oil cooler tube sub-assembly, and slide the 2 clips to secure them. (c) Connect the No. 4 oil cooler inlet hose and No. 4 oil cooler outlet hose to the oil cooler tube, and slide the 2 clips to secure them. (d) Then pass the No. 4 oil cooler inlet hose and No. 4 oil cooler outlet hose through the clamp and close the clamp. (a) Install the 2 oil cooler tube clamps to the automatic transmission assembly and engine assembly with the 2 bolts. (b) Install the No. 1 oil cooler inlet tube, No. 1 oil cooler outlet tube and 2 flexible hose clamps to the 2 oil cooler tube clamps with the 2 bolts. (a) Install the No. 3 oil cooler inlet hose and No. 3 oil cooler outlet hose to the No. 1 oil cooler inlet tube and No. 1 oil cooler outlet tube, and slide the 2 clips to secure them. (b) Connect the No. 3 oil cooler inlet hose and No. 3 oil cooler outlet hose to the oil cooler tube, and slide the 2 clips to secure them. When the transmission oil thermostat is replaced with a new one, pull out the pin from the new transmission oil thermostat. (a) Coat 2 new O-rings with ATF, and install them to the transmission oil cooler assembly. 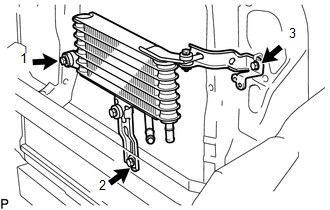 (b) Align the transmission oil cooler assembly with the transmission oil thermostat and assemble them with the 3 bolts. 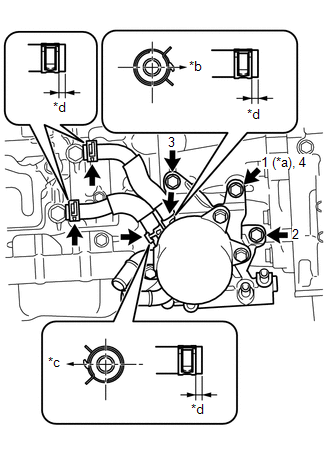 (c) Install the transmission oil cooler assembly with transmission oil thermostat to the automatic transmission assembly with the 3 bolts in the order shown in the illustration. (d) Install the No. 1 oil cooler inlet hose and No. 1 oil cooler outlet hose to the transmission oil thermostat, and slide the 2 clips to secure them. (e) Connect the No. 1 oil cooler inlet hose and No. 1 oil cooler outlet hose to the automatic transmission assembly, and slide the 2 clips to secure them. 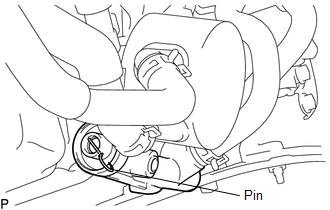 (f) Connect the 2 water by-pass hoses to the transmission oil cooler assembly, and slide the 2 clips to secure them. (a) Install the No. 2 oil cooler inlet hose and No. 2 oil cooler outlet hose to the transmission oil thermostat, and slide the 2 clips to secure them. (b) Connect the No. 2 oil cooler inlet hose and No. 2 oil cooler outlet hose to the No. 1 oil cooler inlet tube and No. 1 oil cooler outlet tube, and slide the 2 clips to secure them.